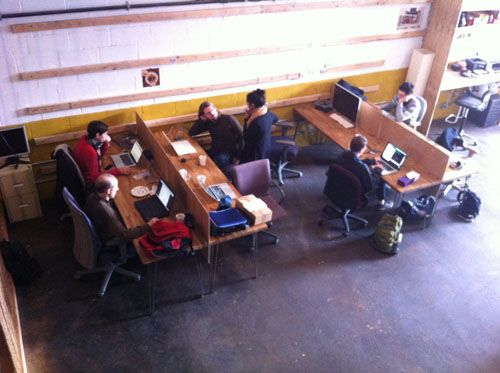 NYC startups band together to share power, bandwidth #sandy « Adafruit Industries – Makers, hackers, artists, designers and engineers! As the city of New York struggles to get back online in the aftermath of Hurricane Sandy, many companies and start-ups are trying to regain their footing and restart operations. The problem is, much of Lower Manhattan, where many are located, is still without power and Internet. But entrepreneurs, engineers and developers aren’t letting that stop them. They are camping out in one another’s apartments and offices in an attempt to still get a day’s work done. Of course, any place with a humming Wi-Fi connection, whether a coffee shop or an Apple Store, seems to be drawing displaced workers eager to get back into the swing of things. But camaraderie spurred by the storm seemed to knit the New York start-up scene together a bit tighter. Above image is from littleBits working at Bat Haus Coworking in Brooklyn last Thursday.